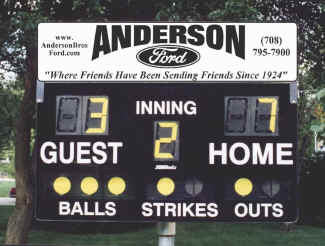 The sponsor panel is a black aluminum panel attached to the top of the scoreboard, that is used to hold an advertising sign. The panel is hinged and flips down for storage when not in use. Customer supplied advertising signs with computer cut lettering and logos are typically obtained from a local sign shop at a cost of about $35, and are usually attached to the sponsor panel with double-faced sign tape.